top: Title spread. Drawing by Janice Mae Schopfer. Title in Goudy Open type. lower left: Cover. 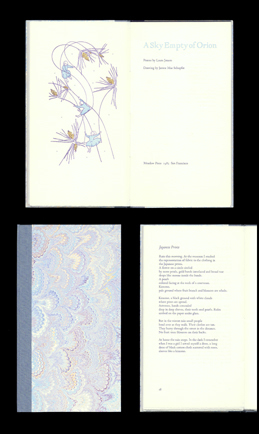 Marbled paper sides by Peggy Skycraft; cloth spine over boards. lower right: Text page. Centaur and Arrighi types on white Lana Laid paper.